Finding yourself with a storm window crack can be upsetting, especially if you were not ready financially to take care of a repair like this. Fortunately, fixing a window crack is not always something that requires buying an entirely new set of windows. Additionally, while you could invest in hiring a professional to repair the window, you could save time and money by fixing it yourself or purchasing a set of gently used storm windows. It is a good idea to think ahead before going through with the repair by yourself. If your windows are relatively new, or if they were purchased with a warranty of any kind, make sure to read through the warranty first. Of course, you only want to take time to do this if there is no urgency with the repair need. If a warranty is still in effect, be sure that the cause of the cracked storm window does not make it eligible to be repaired at the manufacturer's expense. You also want to be sure that if the repair is not covered under any warranty that if you do perform the repair yourself and somehow make a mistake that damages another part of the window it will not invalidate the existing warranty as it applies to the other part of the window. Once you have done this and still feel confident about going through the repair process on your own, there are a few repair options to choose from. 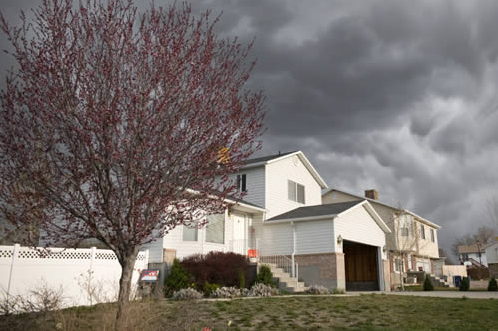 If the cracks occurred during a storm and you have a relatively immediate need to keep rainwater out of the home, there are quick fixes to opt for first. If you have noticed that the window became cracked during or after a recent storm, you may not have a lot of time to think about repair choices. For a quick fix which will mostly help to keep rainwater from leaking into the home, you can opt to cover the crack with duct tape. This is a temporary fix, naturally, but it can help to give you the time to determine if any warranty will apply. For a more permanent repair to the window, you can visit a local hardware or home supply store for a sheet of glass. The glass can be cut to suit the exact measurements of the window and you can make use of the existing materials inside the frame of your window to secure the new pane of glass. You may want to buy a clear plastic or acrylic material for the repair which is less expensive and safer, too, for the repair process. You need to remove the window and lay it out on a flat surface. It is a good idea to have a drop cloth or other covering to work on. Begin by removing the existing glass by unscrewing the screws to the frame and accessing the glass by lifting the top rail. The inside material, usually a rubber stripping or gasket, can be molded around the new glass to secure it into the frame. Insert the glass so it fits into the channels along the inside of the frame. Replace the screws to the frame and carefully line the window up and insert it back into its original place. You could also opt to break the glass out before removing the window. Then, lay the window down on the flat surface and remove any remaining pieces of glass before inserting the replacement glass or clear plastic or acrylic. The repair can last for a few years. In fact, some acrylic materials are warranted against discoloring, too.